I was so excited about becoming a grandmother that I started to write The Grandma Chronicles even before my grandson was born. At first it was all about joy. But just as our view expands with being a parent it does with being a grandmother. My grandson is 4 ½ and I still flip with joy when I am with him, but now I think more about what I want to offer to him as a grandparent. And I don’t mean just what money can buy. Oh sure, there’s plenty of that but there is so much more that is important. January is when we celebrate Martin Luther King, Jr. Day – a day of national service and it is National Mentoring Month. January is also a time for making New Year’s resolutions. So putting this all together it is a perfect time to think about becoming a mentor – to your grandchildren and other children. 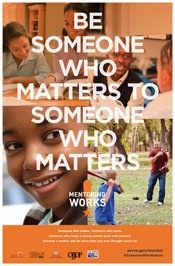 Two good websites to learn more about mentoring are the National Mentoring Month website and Mentoring.org. The theme for National Mentoring Month is "Be Someone Who Matters to Someone Who Matters." This is certainly what all of us grandparents want to be. 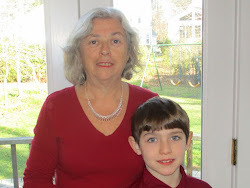 I was thinking about writing a post about grandparents and mentoring when I saw that my Grandmother blogging friend, Lisa Carpenter, had written a wonderful list at her blog, Grandma’s Briefs. Click here to see her whole article. ■ Share knowledge and life experiences. ■ Provide guidance and advice. ■ Listen, showing genuine interest in questions and concerns. ■ Be open and honest. ■ Support new interests and efforts. ■ Explore different careers, regardless of how unrealistic they may seem. ■ Provide and help identify resources that support interests, goals and dreams — books, classes, websites, outings and experiences. This list made me feel good because I think I do these things and often unconsciously. I bet you do to. I think I can improve on them if I think about them consciously and so I have given this list a deeper review. I have an important item to add. Model and teach values. This came to my mind when my husband and I were reviewing some old videotapes of our kids that we are planning to transfer to DVDs. In one video I am wrapping Christmas gifts for children with my young children and my husband asks why am I wrapping the kids’ gifts in front of them. We were wrapping gifts to be sent to a family in Appalachia and the kids were helping. I said that this was a tape that we could skip putting on DVD but my husband disagreed. He said this is part of our legacy, of who we are and who we want to model for our grandchildren – helping others. He was right. I want to mentor my grandchildren and other children too. And I want helping others to become part of who they are. My mind is buzzing with how I am going to work this into action with a four year old. But I know I will because it is important. Here’s a post I wrote earlier this year about mentoring…. Please leave your comments how you mentor your grandchildren or other children. A great post. I don't consider myself a mentor but I do volunteer a lot at my granddaughter's school. I think doing it shows her and her fellow classmates that I think education is very important! It also teaches them that volunteering is a great thing to do. I highly recommend it! Grandparenting does involve mentoring - a blessing to both grandparent AND grandchild. Thank you for sharing your thoughts and ideas with us. We have 6 grandchildren so far, ranging in ages 1 month to 4 1/2 years, and we love them to pieces! Stopping by from the Grand Social.